Does the Market Care About the Sequester? The sequester officially takes effect tomorrow and there has been almost zero negotiations between the White House and Republican leaders over avoiding the cuts. Instead, both sides have spent most of their energy blaming the other side. The media has done an excellent job covering this aspect of the sequester, but it has ignored another major part of it: market reaction. Remember, the sequester was enacted in the summer of 2011 when Republicans took the debt ceiling hostage and we almost defaulted on our debts. In the immediate aftermath of the deal, investors were happy that the U.S. Congress had avoided creating an artificial economic crisis. However, part of that optimism stemmed from the sequester. If the Super Committee failed (as it eventually did), then Congress would have to find a way to either replace the sequester or accept the sledge-hammer cuts. For a while now, a number of serious people on Wall Street have been calling for deficit reduction. I don’t agree with their analysis, but that’s what many people on Wall Street want. Does that look like the market is panicking about the sequester? Not at all. No one wants these cuts, our government is too dysfunctional to even negotiate over them and yet the Dow has almost reached a new high. Why? One possible reason may be other factors. Fourth quarter GDP was revised upwards today and unemployment claims came in below expectations. But none of that explains the previous two days rising market. Of course, it is always tough to pin down a reason for why the market does what it does. No one knows for sure. But I’d hypothesize that the sequester hitting is actually reassuring markets. The government is not just removing the sequester without replacing it. Although I would support such a bill, Wall Street would not. As I said above, Wall Street wants deficit reduction and the sequester cuts spending. It may not do so in a smart way, but it cuts it nonetheless and Wall Street is pleased that we are actually reducing the deficit. It also shows that Congress can constrain future Congresses. This is always a tough thing for Congress to do. It can enact as many deficit reduction plans as it wants, but if future Congresses just repeal those spending cuts/tax increases, than any long-term plans that Congress legislates will be meaningless. Future Congresses will just undo them. But the sequester is demonstrating that future Congresses will not just ignore previous reduction plans. Part of this is a result of partisan gridlock, but if that’s what forces future Congresses to abide by the deficit reduction plans of the current Congress, so be it. That works just as well for the markets since that partisan gridlock doesn’t seem to be disappearing anytime soon. Of course the impacts of the cuts, while unclear, will still hurt the economy and even if Wall Street is hoping the cuts take effect, it’s still bad policy. It also brings up a different question: if we were to just get rid of the sequester, would markets revolt? I’m not sure and it doesn’t look like we’ll ever find out. But it’s a question the media has ignored entirely and deserves more coverage. Honestly I think that people aren’t reacting to the sequester simply because it is getting old. We have had constant talk about national debt, debt ceiling and deficits for months and months. It never really stopped between the talk before the start of 2013 and now. After months of fiscal cliff fear being built I think people are just plain sick of it and don’t care anymore. We’ve been talking about national debt and deficits since 1980 at the very least. That’s as long as I can claim to be able to remember anyway. And it’s been pretty much non-stop. It is old. After a while–like maybe 20 years ago–it started to seem a like a problem everyone wants to whine about and no one actually wants to solve. There’s a point when it seems like we either need to figure it out or shut up about it. I completely agree, either do something or shut up. Neither party really seems to want to do anything. The deficit reduction they talk about it minor in comparison to the overall deficit. But they like to make it sound like some grand solution because they throw around 10yr deficit reduction numbers rather than single year numbers or numbers on the % of deficit reduced. I agree that cutting spending could hurt the economic recovery but it depends on how spending is cut. The sequester clearly would not be good the economy. But cutting spending by being smarter may not harm the economy at all. There is a lot of waste in government spending and trimming that up could be good for the deficit and national debt while not effecting the economy negatively. The general media has ignored it, but CNBC — the business channel — has been all over it. It seems the reason why the market is rising is things have stopped getting worse, and our Fed Chairman has almost written in stone he will keep interest rates low however long is needed. So the result is, where do you put your money? In an interest bearing account at 1%, or do you take on more risk — the market — for a higher return. And I don’t think the general media has been covering the sequester fairly at all. Just look at what just happened with Bob Woodward when he tried to hold this administration accountable. He was actually threatened. The best way I heard this sequester explained was this: You go home and tell your spouse I have good news and bad news. The good news is I’m getting a raise from $100,000 to $110,000, the bad news is due to the sequester, that raise will be reduced to $107,000. It’s approximately a 2.4% cut on the increase, not a reduction. Both sides have played this like theater, and the press has acted more like PR reps for the President. Woodward — a liberal democrat — was the only one with the guts to question the President’s intent. Good thought provoking post. I agree that Bernanke’s commitment to low rates has spurred the markets, but it is still surprising that the sequester’s cuts, which no one wants, and Italy’s election meltdown have not scared the market. 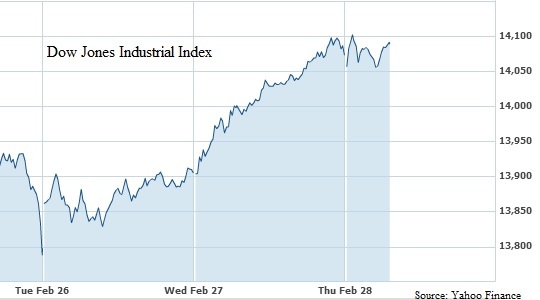 The Dow keeps rising. That’s a bit surprising even given Bernanke’s actions. As for the Woodward comment, read through his actual emails (johnhaskell posted them in the comment below). There was no threat. It was just Woodward making a story out of nothing. And cuts are more then just that. They’re across the board cuts that do cut some waste, but also cut some of the government’s best programs. Cutting R&D is not smart. As far as this notion that things have stopped getting worse; perhaps for the investor class, not so much for the working class. “I apologize for raising my voice in our conversation today. My bad. I do understand your problems with a couple of our statements in the fall — but feel on the other hand that you focus on a few specific trees that gives a very wrong perception of the forest. But perhaps we will just not see eye to eye here. The sequester has been a topic on CNN for several days now. I personally have come across quite a few government civilians who have received notices today about cutbacks and job loss. My coworkers and I find out tomorrow. So I’m pretty sure people are feeling the pain or at least stressing out over it. I know I am. Let’s first be honest about the source of the sequester — it came from the White House and it was offered to Harry Reid as a way to force Republicans to raise taxes. So, it’s Obama’s idea and he can’t blame anyone else for it. You can find other things to blame the GOP for, but not that. Then let’s also be honest about what sequester really means. We’re talking about less than 2% of total federal spending. That’s right – 2%. It’s going to affect us a bit and that’s a good thing. It’s time we got serious about deficit reduction. This isn’t serious. 2% is barely a drop in the ocean, but it’s a start. Add another 30% to that and we’d be heading in the right direction. The world won’t end. Dogs will not mate with cats. Any government closures will be caused by those in charge deciding to scare you. It’s 2%. Big deal. Are you scared yet? Then the government got what it wanted without withholding a dime of federal payroll. First, I never blame the GOP for the sequester. Nor do I blame the WH. I’m actually with Joe Weisenthal on this one: the sequester was smart policy that adverted a crisis over the debt ceiling. It avoided what could’ve been a economic catastrophe. As for the 2%, that’s still a large cut. First, these cuts are incredibly dumb as everyone has documented. Second, we’ve already done quite a bit of deficit reduction. Kevin Drum summarizes it well here: http://www.motherjones.com/kevin-drum/2013/02/were-90-way-simpson-bowles. If you want to get serious about deficit reduction, then you have to re-examine health care. That’s what’s driving our long-term costs. Steven Brill’s long article in Time this past week is a good place to start – it lays out just how much we overpay for healthcare. So if you want to take the deficit serious, starting thinking about how you want to reduce healthcare spending. I think people are getting tired of the marketing going up and down. I hope it stabilizes. What do you think? The Sequester cuts amounts to less than 2.5 percent of the total U.S. annual budget. All the Obama Administration’s “the sky is falling” stories are just bunk and the market knows it! That’s why the market rallied today. Obama is exaggerating the effects of the sequester to the extreme. Though it will likely impact economic growth. The cuts amount to approximately a half of percent of GDP which is not that much. The big question is the cuts will interact with the economy. It could result in a minor blip in GDP. But if the cuts do result in a lot of jobs being lost then it could hit GDP even harder since those people would no longer be contributing to the economy. I heard on NPR today the the market is pretty immune from the workings of the sequester. I guess the market got smart! Remember… Obama and his administration originally came up with the idea for the sequester and Obama even said, “I will veto any effort to get rid of these automatic spending cuts.” True though that both Republicans and Democrats all voted for it in Congress, but let’s not forget the source! However, I think that the way Obama describes the sequester, markets should be concerned and should care. If the “cuts” are made with any intelligence or effort to get rid of our $17,000,000,000,000 debt, I doubt the market would care. I believe if the cuts are made wisely, this sequester will be a great first step in lessening our out of control spending problem…YES a spending problem, Nancy! While it’s difficult to predict why the market moves in either direction in the short run, it usually responds favorably to individual companies that attempt to cut costs, even in the form of massive layoffs. This sequestration is merely a blip on the radar of the government attempting to control its costs. So no surprise on the continual bullish trend. Thanks! Reblogged this on Gerli Wren Co. Panama Legal Blog. Very good post. There is a lot of emotion on your part in trying to get to the answers that the media and Congress do not connect to Business on Wall Street. The Sequester is a good thing. Companies will downsize once again by cutting labor costs which in time will lead to higher profits. This is not rocket science. The same effect took place at the end of 2012. Layoffs prior to the Fiscal Cliff escalated the market. For every escalation there has been a reduction in employment. This is all temporary or short term reactions. In the long term you will see the effects of negotiations in limiting the cuts in spending to particular sectors and you will see corresponding market increases. Remember that in October 2013 another $100 Billion in spending cuts is to occur. Gee little media on that one. Very nice post and thoughts.. would love reading this again..
Nice article Danny. Two market days later and the DOW remains unscathed. They’re predicting record highs for the DOW this week! The markets care about monetary policy. As long as monetary policy is appropriate the Fed “remains fully capable and committed to offsetting fiscal tightening”, in the words of BB. In europe, where monetary policy is far from appropriate, austerity can move markets. Monetary policy beats fiscal policy always. Good fiscal policy can never overcome bad monetary policy, and good monetary policy can overcome even hopeless fiscal policy. If I hear sequester one more time, I’ll…..Ok, I have no idea what to do. Watching the stock market break record highs should be a reason to rejoice. I’m not screaming out “Thanks be to God” I am wondering what is going to happen when everyone notices our economy is not supporting these record highs. Thanks for a good blog. The Sequester was President Obama’s idea according to the Washington Post. Please check out the links on my blog. In addition,cuts could have been made without affecting the middle class but some believe that this is a political move by the president to hurt the Republicans in the next election. According to the Washington Post, they tried to negotiate and he asked for more.